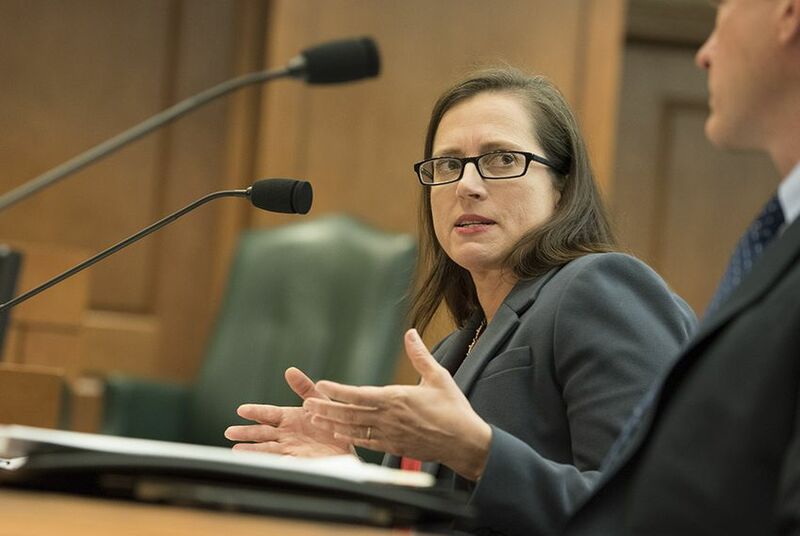 The head of the little-known Texas Legislative Budget Board retired this week, adding a coda to years of differences between the agency's two masters — the Texas House and the Texas Senate. We already knew the Legislature was going to start its January session without a House Appropriations Committee; naming a new budget-writing panel will follow the election of a new speaker of the House. Now there’s a new kink in the preparation of the state’s next two-year budget: Ursula Parks, the beleaguered director of the obscure but critical Legislative Budget Board, is retiring at the end of the month. Her departure is notable for a couple of reasons that have nothing to do with Parks and everything to do with the finances at the heart of state government. The LBB has played the part of the rope in a fierce tug-of-war between the House and the Senate. Parks’ departure caps a series of tense moments between lawmakers and a prominent agency that belongs not to the executive branch, like most agencies, but to the Legislature itself. And it beheads the third of those agencies, adding to vacancies at the top of the State Auditor’s Office and the Sunset Advisory Commission. Both the LBB and the SAO are co-chaired by the lieutenant governor and the speaker of the House; Sunset is run by a board directly and indirectly appointed by those two officials. While those agencies are set up to serve state senators and representatives — the Texas Legislative Council and the Texas Reference Library are in this category, too — they’re also in the sometimes-uncomfortable position of serving two masters. Nothing like a good bit of interbranch bickering to get the popcorn popping. And since the board of the agency is made up not of bureaucrats but of elected officials, it looked like a good one. But the lieutenant governor, co-chair of the LBB, took Abbott’s side. • At the beginning of the 2017 legislative session, Lt. Gov. Dan Patrick directed the LBB not to publish its biennial report on how to make the government more effective and efficient, saying through a spokesman that the agency “should focus on their principal mission, which is developing the budget, and leave the policy making to elected officials.” House Speaker Joe Straus sent a letter to Parks asking her to distribute “efficiency and information reports” prepared by her staff, effectively pushing the contents of the stalled report into public view. • The Senate decided not to fund its half of the cost of the LBB in the current budget — a blunt signal of its feeling about Parks’ agency. • The latest tempest was over publication of one of the few easily understandable budget documents in state government — a spiral-bound 620-page wonder called “Fiscal Size-Up.” It comes out every two years. The people who write the budgets and the people who closely watch those budget-writers lug it around or carry downloaded versions in their laptops and phones and tablets, ready to whip out this or that number, paragraph, explanation or footnote. It’s so easy to understand it can get the authors in trouble. The book is where lawmakers, bureaucrats, reporters and lobbyists go for quick explanations of where state money comes from and where it goes. It’s where they find, in terms non-experts can understand, things like how the state’s share of public education spending has dropped while the local share has climbed. That one was the source of some recent tension between House and Senate leaders and the agency that, like a dog with two leashes, is in the middle. Here’s an indication of how hard it can be to turn out something like that when you’re trying to explain things like school finance with all those bosses. It’s all in the publication dates: The 2010-11 edition came out in December 2009. The 2012-13 version was published in January 2012, a month later in the two-year cycle than the one before it. The 2014-15 version? February 2014. The 2016-17 Size-Up came out in May 2016. The new 2018-19 edition landed this week — the day after Ursula Parks announced her retirement.